The Ikaros solar sail, developed by Japan Aerospace Exploration Agency (JAXA), is now receiving a speed boost from light radiated from the sun. 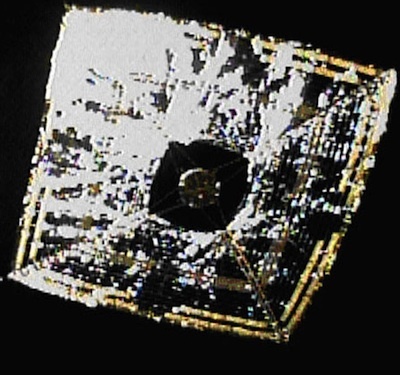 "The small solar power sail demonstrator 'Ikaros,' which successfully deployed its solar sail, was confirmed to accelerate by [the] solar sail receiving solar pressure," JAXA officials said in a July 9 update. "This proved that the Ikaros has generated the biggest acceleration through photon during interplanetary flight in history." The effect stems from the cumulative push of light photons striking the solar sail. When measured together, it adds up to a small continuous thrust that does not require fuel use by the Ikaros craft. Science fiction fans remember the light sail from Jack Vance's excellent 1962 short story Sail 25 and the interstellar starlight sail from Cordwainer Smith's 1960 story The Lady Who Sailed The Soul. Johannes Kepler speculated that comets' tails are bent by the sun's action in his 1619 book Opera Omnia. Newton thought it was possible that light would exert pressure on material bodies. The existence of light pressure was demonstrated in theory by James Clerk Maxwell in 1873. Laboratory experiments confirming the theory were performed in 1910 by P.N. Lebedev, a Russian physicist, who overcame great difficulties in measuring the 4.7 x 10-6 N/m2 pressure of noon sunlight here on Earth. In the 1920's, Konstantin Tsiolkovsky and Fridrich Tsander wrote about "using tremendous mirrors of very thin sheets... using the pressure of sunlight to attain cosmic velocities." The first mention of solar sails in a science fiction publication was not in a story; it occurred in the May 1951 issue of Astounding Science Fiction. Carl Wiley published an article called "Clipper Ships of Space." Via Tariq Malik at Space.com.